description & equipment The 15 centimeter tall Lela made of especially soft plush material and her 25 centimeter tall 'older sister' complement the portfolio centered around the LÄSSIG fawn. 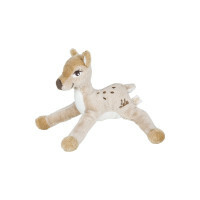 The friendly face, adorable round eyes, funny dangling legs and the natural color combination resembling a real fawn make the hearts of cuddly toy lovers leap for joy. Little and also big fans of Lela will be excited. Lela is finally coming to their homes. This toy has been tested in accordance with the EN 71 standard.